Carolyn Daly ’06 (right) participates in a hand-washing demonstration by Aura Perez (left), who teaches children hygiene lessons to combat illness. This is the story of two women, both mothers who wanted the best for their children. The first woman grew up in the western highlands of Guatemala. She dropped out of school in fourth grade to work and to care for her younger brother. It was what was expected of her. The second woman grew up in a rural central New York town. The youngest of five, she spent her childhood playing sports and dreaming about her future. It was what was expected of her. The first woman, Aura Perez, married at age 17 and had her first child at 18. She made money cooking, cleaning, and selling drinks on the street while her husband worked as a day laborer in the fields. 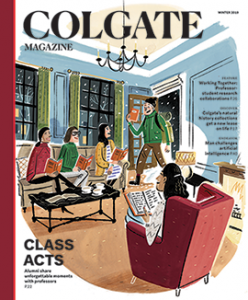 The second woman entered Colgate University at age 18 and spent the next four years playing field hockey, interning at the Supreme Court, and graduating with a degree in political science. She moved to Washington, D.C., and worked at a research firm and then a bank. I am that second woman. Aura lived simply but happily with her growing family of eight. On many days, they didn’t have enough to eat, so her oldest daughter dropped out of school to work. I joined the Peace Corps and was placed in Sololá, Guatemala, where 94 percent of families live on less than $3 a day. I learned to appreciate the little things, and I fell in love — with the way Lake Atitlan reflected the sky, a blue so deep that it looked like a painting; with the pat pat pat of tortilla making at 6 a.m.; with the city of Sololá. And with a man. Aura wanted to provide a better life for her children. 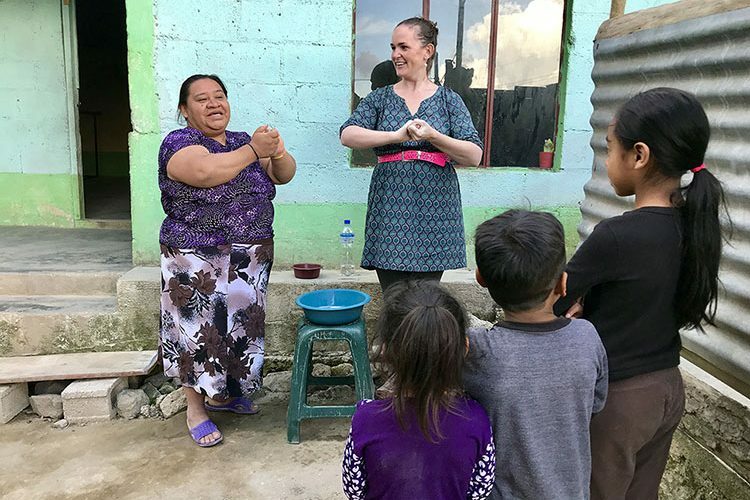 She heard that Mil Milagros — an organization that equips women with skills and resources to improve the lives of children and families in rural Guatemala — was coming to her children’s school. They needed mothers to help, so she signed up to cook once a week. After finishing my Peace Corps service, I decided that Guatemala was home. I married and we began raising our two young children there. When I started as the in-country director at Mil Milagros, I fell in love again — with the mission, the children, and the mothers who help it succeed. Aura is one of more than 1,000 mother and grandmother volunteers trained by Mil Milagros. She began volunteering to cook in the school, then became a mother leader who now trains other mothers in nutritional and hygiene practices as well as gives hygiene demonstrations to the children. Working with Mil Milagros gave her the confidence to resume her schooling, where she is one of two adults in the eighth grade class. The other is her daughter Marina. Aura and I are different. I grew up in a country of privilege and opportunity. Aura grew up in a country torn by civil war, corruption, and poverty. There is no denying the differences in our lives and our experiences. But we are both mothers who want the best for our children. I am grateful to have found an organization that partners with communities to improve the health and education of families, and allows me to work with inspiring women like Aura.